Abstract: BACKGROUND: Kaposi's sarcoma-associated herpesvirus (KSHV) is associated with AIDS related Kaposi’s sarcoma and primary effusion lymphoma (PEL). KSHV hijacks multiple cellular proteins and pathways to establish lifelong latency in infected hosts, and latency is associated with KSHV malignancies. It is well known that KSHV uses the repertoire of host epigenetic mechanisms to orchestrate its gene regulations. We have previously shown that Interferon-γ inducible protein 16 (IFI16), a host nuclear innate immune DNA sensor, plays an important role in the maintenance of KSHV latency [J Virol. 2016 Sep 12;90(19):8822-41]. In addition, studies from our laboratory and others have suggested that IFI16 acts as an antiviral restriction factor against lytic replication of a number of DNA viruses, by inhibiting either viral-DNA replication (HCMV and HPV) or transcription (HSV-1, HCMV and HPV) through epigenetic modifications of the viral epigenome. However, till date, no specific epigenetic function of IFI16 has been identified to support this claim. 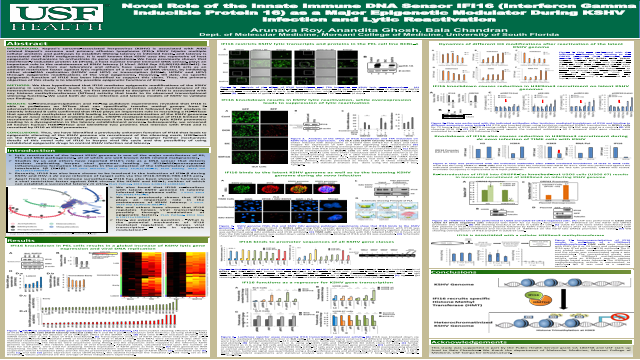 Thus, the primary objective of this study is to identify possible epigenetic functions of IFI16. METHODS: We thus hypothesized that IFI16 mediates epigenetic modifications of the KSHV episome in some way that leads to its heterochromatinization and/or maintenance of its heterochromatic form. To this end, we first attempted to decipher if IFI16 is associated with any histone methyltransferases (MTase) activity that leads to its observed transcriptional silencing function. We used both de novo infection and latency models of KSHV to validate our findings. RESULTS: Co-immunoprecipitation and His-tag pulldown experiments revealed that IFI16 is able to pull-down an MTase that can specifically transfer methyl groups from S-adenosylmethionine (SAM) to histone H3. Knockdown of IFI16 followed by ChIP analysis in latently infected B cells confirmed that IFI16 plays an important role in recruiting a H3-MTase that specifically methylates at H3K9 leading to heterochromatinization of the KSHV genome. During de novo infection of endothelial cells, CRISPR mediated knockout of IFI16 limited the recruitment of H3K9-me3 and RNA polymerase II on both latent and lytic KSHV promoters leading to a dysregulation in the latency establishment process. Subsequently, we screened all known human H3K9-MTase and identified two proteins that interact with IFI16 and is recruited by IFI16 at KSHV promoters. CONCLUSIONS: Thus, we have identified a previously unknown function of IFI16 that leads to epigenetic silencing of the KSHV genome via recruitment of the silencing mark, H3K9-me3 on the KSHV genome. Presently studies are underway to decipher further mechanistic details of this novel role of IFI16 in herpes viral life cycle and the possibility of using established epigenetic drugs to control KSHV infection and latency.